Like most people with the baking bug, I absolutely love shopping for baking accessories – shaped pans, colored sugar, cute stands…It’s so great to find some little set of shaped sprinkles or decorative flags for cupcakes that spark your imagination. I had this happen recently to me when I found some Pooh Bear cupcake papers. I’ve loved Pooh and his adventures my whole life and am especially fond of Piglet (I always claimed it’s because I’m also a Very Small Animal…I even have a Piglet tattoo! ), and what better way to celebrate a fat little hunny-loving bear than with cupcakes that featured lots of hunny! I used yellow sugar and chocolate jimmies to make different patterns. Since most of the recipes I found online for honey cake seemed to all be for a particular traditional Jewish dessert that was too dense for the kind of cupcake I was envisioning. I decided to try a vanilla cake and a honey frosting, and also to get to know my nice red Kitchenaid. I tried one recipe last night (just the vanilla cupcakes from the Joy of Baking website) and was disappointed in them. I may not have mixed them enough, but whatever went wrong, they were muffin-like in their density and their flavor was more butter than vanilla. So I whipped up some double chocolate ganache and tried out my new icing kit, which was fun but nothing special (and I definitely need more cake-decorating practice). I had to find a new recipe, and decided on the basic Vanilla Cupcakes from Cupcake Recipes. I knew I wanted a lighter cake than I had previously ended up with, so I chose the recipe in part because I noticed it involved whipping egg whites in the batter. I ran into one problem with the recipe, however: It calls for both 4 egg whites and 2 whole eggs…and never tells you when to put the whole eggs in. So…I didn’t. And the cakes turned out perfectly fine. I added some extra vanilla, but that flavor was overshadowed by the star of this particular treat – the rich, smooth whipped honey frosting. The recipe is so simple that I don’t even know where I originally found it, and is definitely worth it. However, I would absolutely NOT serve this dessert to young children (despite the kid-friendly papers) because of the large quantity of honey and the small risk of salmonella from the egg whites in the frosting. I wouldn’t consider it a huge health risk for most people, though, since the honey is added to the whites while boiling…That’s got to kill a lot of stuff, right? 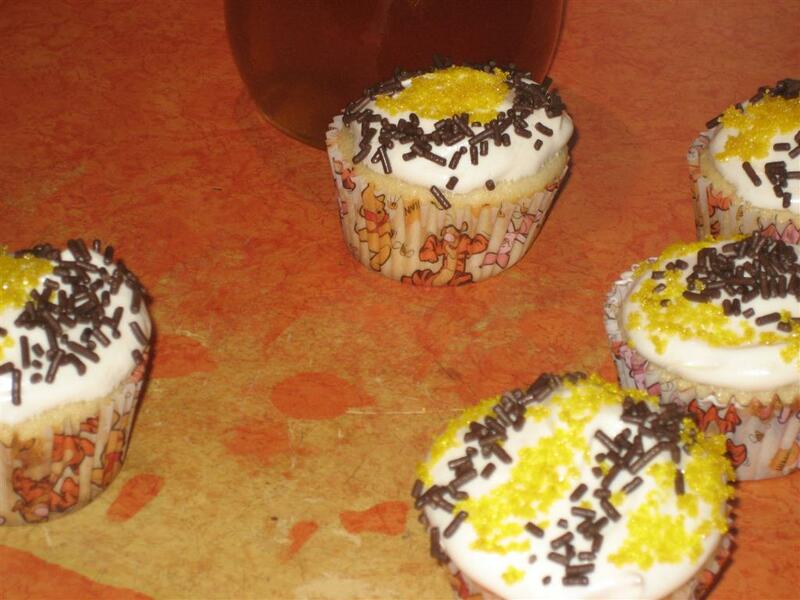 Raw eggs or not, these cupcakes are very tasty and will have you buzzing like a hummingbird (or a honey bee!) from all the sugar. I’ll definitely make the frosting again, but will continue to play around with the cake. I really want a strong honey-vanilla flavor overall…I used to eat a totally awesome honey-vanilla ice cream when I was younger and it’s such a fantastic flavor combination! I’ll probably wait until I have some real vanilla beans to attempt the cake again. For all my nitpicking, though, these are yummy sweets that a certain little bear would definitely approve of. This was the most bee-like one, so I added wings on him! Preheat oven to 350. Place everything but the whites in a mixing bowl and blend on a low speed for a couple of minutes, then add the whites and mix for another couple of minutes at a high speed, until everything is fluffy, well-blended and smooth. 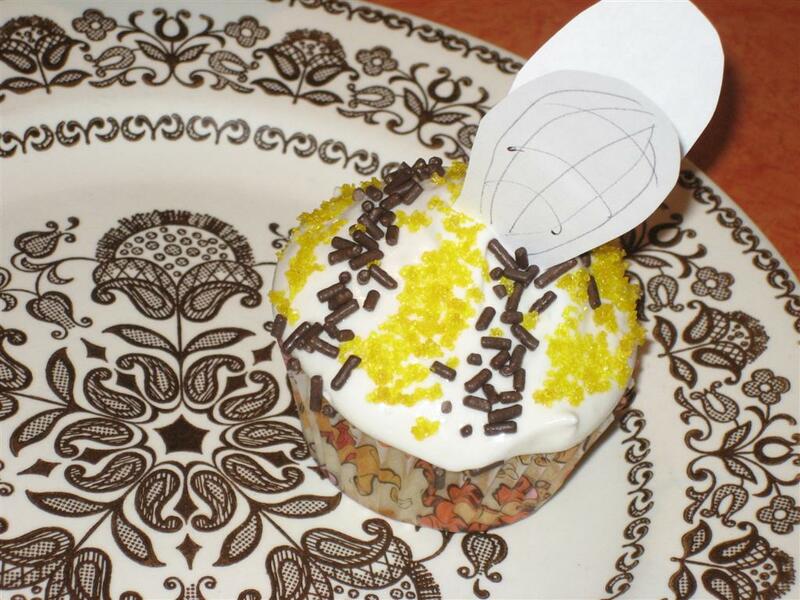 Pour into muffin tins lined with cupcake papers, filling cups about 2/3 to 3/4 full. Bake 10-15 minutes, or until a fork inserted into the top of one comes out clean, but not until they start to brown. Set aside to cool and prepare the frosting. Pour honey into a small saucepan and heat over low heat until it boils. While you wait, combine the whites and salt into your mixing bowl and beat on high with a wire whisk until stiff, but not dry, peaks are formed. Pour the boiling honey into the bowl slowly in one continuous stream while you contine to mix on medium, then turn it up to high for another couple of minutes or until stiff peaks form. Spread onto cooled cupcakes and decorate with sugars and/or sprinkles. We ended up with extra frosting – it REALLY fluffs up! I’m not sure exactly what to do with it yet, but I’ll think of something. Maybe just another batch of these. I also was going for a vanilla sugar thing with the decoration. You can clearly see the chocolate jimmies, but the sparkly yellow stuff is dyed decorating sugar that I mixed with a bit of vanilla extract. It didn’t really work but I still had a sticky good time with these!